Last time I visited my grandmother, who is in her 90’s, she passed an old family book on to me, a copy of The Child Welfare Manual from 1915. It had been given to my grandmother’s mother–my great-grandma–by her mother-in-law (my great-great-grandma). At the time, it was the most up-to-date, cutting edge, in-vogue advice for keeping the home and rearing children. In its introduction, it claims that the manual is practical, simple, authoritative, and complete, touching not just on the physical needs of children, but mental training and, “the even more important topics connected with the social life of the child and his moral and religious nature.” It was the book that all the right people were using to raise their offspring. It provides a fascinating look back at the attitudes, ideas, and parenting fads a century back. Some things have changed radically (the advice to not let a father do any night parenting, because he had worked all day), some things changed and are shifting back (it has a very enthusiastic section on breastfeeding). Every time I read a piece of this book, I am reminded of the old Virginia Slims ads on the back of Mom’s Womens’ Day magazines, “You’ve come a long way, Baby!” Boy, have we. It covers a wide variety of topics, addressing the physical needs and environment–including advice on proper furniture. A far more pertinent section details what should be in every mother’s medicine cabinet. Remember, at this time aspirin had only been on the market for 16 years. It was before acetaminophen (marketed in 1950) and ibuprofen (marketed in 1974 for RA), before antihistamines (1943), even before band-aids (1920). All these are in most homes in the United States today. 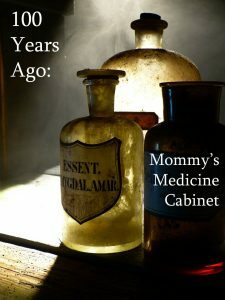 However, the recommended medicine cabinet 100 years ago looked very different, and chances are that most of us wouldn’t recognize the contents. Cascara Sagrada, for constipation; aromatic chalk powder and opium to stop diarrhea (these were available as a combined pill at the time, he notes); cathartic compound, to be used as an intestinal purge; potassium permanganate, as a disinfectant and antiseptic (he also recommends this for snakebite, but doesn’t give details as to how); alum, which could be used as an eyewash, for sore throats, to toughen tender feet, and stop bleeding (this is still used in styptic pencils to to stop small cuts from bleeding, and alum is also used in pickling); quinine bisulphate, for colds, and of course, malaria; salol, as an “intestinal antiseptic” when something disagrees with the stomach; phenacetin compound, for headaches and neuralgia (he recommends taking it with caffeine to avoid the depressive side effects);lead and opium lotion, to be applied topically to bruises and sprains; and corrosive sublimate aka bichloride of mercury, which he first warns is a very dangerous poison, before assuring his readers that they are sensible and will follow the directions for dilution on the bottle before using it as a “powerful antiseptic” to prevent blood poisoning. He further recommends certain equipment be kept on hand: splinter forceps (tweezers), court plaster, aromatic ammonia (smelling salts), a clinical thermometer, compressed cotton, bandages, absorbent gauze, surgical needles and silk, adhesive plaster, and safety pins. He also warns against having too much in the medicine cabinet, as many of the remedies sold at the time were either worthless or harmful. Some of the recommended medicinal items, such as cascara sagrada, and alum, are still available and were regularly used until recent times. Others, such as opium, phenacetin, and bichloride of mercury, are banned and may not be sold, as they have been discovered to have very negative side effects. It presents an interesting look at what was available and what was considered typical and safe. I’m sure I’m not the only one who looked at terms like opium, lead, and mercury and choked a little. At the time, the studies done–or the folklore–showed these medicines to be effective, and controls on safety were still fairly new. While I agree that the medicine cabinet needn’t be cluttered, I am glad that we moved away from some of these treatments.